Paige plays bass in high school rock band Vox Pop, which means keeping a steady rhythm even in their most raucous rock and roll moments. But in the tense build-up to the Rockfest competition, Paige finds she can't control everything in her life, no matter how hard she practises a... read full description below. Paige plays bass in high school rock band Vox Pop, which means keeping a steady rhythm even in their most raucous rock and roll moments. But in the tense build-up to the Rockfest competition, Paige finds she can't control everything in her life, no matter how hard she practises and how loud she plays. There's stuff happening in the band that she can't put her finger on, a friend who can't handle her own secret anymore and a mysterious guy who plays double bass like an angel. But there isn't much time to sort things out - Rockfest looms and so does the end of the school year, when everything will change for good. 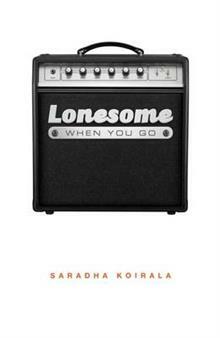 Lonesome When You Go is a novel about practising solo, performing like a rockstar and how contributing your best self to something can create a force much greater than the sum of its parts. Saradha Koirala has played in a number of bands over the years, all with dubious names. She's a huge fan of 90s rock and Bob Dylan but appreciates the nuanced beauty of anything created with purpose, integrity and love. After teaching English at high schools in Wellington for ten years, Saradha now lives in Melbourne with a drummer, a writing desk and a bicycle. She is the author of two collections of poetry, and Lonesome When You Go is her first novel.